My name is Mitchell and I am the team lead for a new baja team at Mississippi State University. My team has background in FSAE and we have been working on the design for a baja car to compete in the 2019 summer competition season. We have used this forum as a great learning resource for a while now an I just wanted to contribute some. I have spent plenty of time working on the suspension and wanted to post some of what we have here and ask what feedback y'all may have or if there is any glaring issues we might have. I will be back shortly to post some pictures of our set-up and further the dialogue. I look forward to being part of the great learning opportunity that is the community of this forum. to start out. here are two screen grabs from SW of our suspension. I know a lot of y'all give high regards to suspension software like optimumk, but I am incredibly proficient with SW so I have done much of the geometry design in solidworks sketches. (you don't wanna see the insanity that is my 3d sketch suspension file). I understand I'm just throwing things at the wall and asking for general advice. I will try to be a better pupil in learning and ask y'all good questions. So here is our ride height set-up and our steering geometry setup. I feel like our camber, caster, ackerman is all good. I think my main struggle with this process is understanding what values to aim for. I.e should i aim for 3deg of static camber or 5deg of static camber. you can see the instantaneous camber, strut length, and track width. does any of this movement seam to extreme? I am mainly concerned taht we may develop a lot of thrust loads in our spindles from the large change in track width. imagine you dropped the car form a height when not moving forward. the wheels would be trying to smear out a few inches as the suspension tries to compress. well. umm how do I post images. I tried copy pasting, and also tried the upload image button in the post editor. well I can at least upload to flickr and share a link to the photos. It looks like you have a good start and as for using SW, our team also uses SW for our suspension design (although ours is way messier). One of the main things that jumps out to me is that you got nearly 9-10° of camber change throughout the suspension cycle. While the amount you need varies for every car, the 3.81° seems a little high. Camber from what I understand is to allow a better contact patch while turning. I know that a lot of pavement race cars use about 0.5-1.5° and circle track cars (including nascar) can get up to 2.5-2.9°, but I suggest reading a suspension design book to get a better idea on how to approach designing suspension. The amount of body roll your car will face will be effected by your shock settings and speed, while 10° is reasonable. The change in track width when the suspension is cycling will effect handling and you have nearly 4", so not too bad. Also keep in mind bump steer and steering in general (as a driver, I've almost beaten up several of our front suspension guys a couple years in a row now do to steering being an after thought to them). You'll just need to read up on this topic and keep at it, and at some point you might be able to get zero camber change when cycling. By the way there are two types of trailing arm rear suspensions you will see in Baja SAE and our team has experimented with both. One is the pure trailing arm, think class 1 buggy (but requires a lot of CV plung), and the other is semi trailing arm system which also has radius rods. Yeah we wanted to focus on camber gain in the turns. While we don't have the tire data to know exactly how much the sidewall deflects, we were able to approximate that much mechanical camber gain would offset the tire deflection effectively keeping the contact patch happily flat with the ground. luckily the dynamics of a ATV tire are much more forgiving to inaccuracies in this process due to their rounded tire face rather then a flat of a road car. I have included a few pictures of our rear end. maybe someone can help me clarify what type of suspension we should call this. The two master level assembly images are of a very outdated assembly model so take it with a grain of salt. the third image is a more up to date version of our trailing suspension assembly, it just didn't have the two connecting rods to show what the suspension was like. From what I understand both trailing arm and semi-trailing arm use cylindrical style joints and their difference is purely whether the axis of rotation is in-line with the vehicle or at a diagonal. Since our suspension uses both a trailing element on a spherical style pivot, and two camber controlling connecting rods. I feel like this is not a true trailing arm style. I have heard mention of a trailing link, but my internet searching has not clarified to well if that is what we have or not. for the time being I guess I will call it a multi-link. We have been trying to read up on suspension design a lot. We hope anyone new to vehicle design and especially baja or FSAE would be smart enough to start with the books. We have certainly dug into some books on dirt track suspension design, and the carool smith "... to win" books. While our understandings of these concepts are growing stronger, we still lack the analytical understanding to actually choose numbers. I.e. we know to keep camber within X and Y degrees but we are still struggling with how to actually choose what exact angle Z we should go with. Also we understand this is a complicated question and involves many inputs and the whole system is dependent upon tons of other things. Because we lacked the analytical understanding to choose exact values we went with the design approach to get the geometries and kinematics of said geometries to look correct at static settings and throuhg the expected motion ranges. we then started to try to incorporate more things into our kinematics. I.e. the camber curves can be made first, then the steering can be designed onto that, and then the damper placement and lengths. Hpefully everything continues to work out well and we can field a great rookie car come may 2019 (even if I'll personally be graduated y then). It has been a few years since I played with the numbers, but as I recall, we wanted to maximize our camber gain because we had fairly low roll centers (our body would lean quite a bit in turns). That camber gain allowed for lots of body roll, and also kept the sidewalls of the tires vertical to almost leaned in during turns. That gave us a TON of traction in the turns. We didn't understeer or oversteer much at all with the setup, so it was imperative to have a lot of steering angular travel. We never rolled in competition, and we could take most corners at almost full speed. We also minimized scrub radius so that we wouldn't shear tie rods all the time when hitting logs. We set a good amount of caster so that the wheels wouldn't camber out while steering and also so that our obstacle impact forces were transferred through suspension links instead of steering links. Steering forces were a little higher, but not unmanageable. If I were you, I would get an acceptable geometry and then work on component design. You might realize that ball joints and other components only have so much freedom and so many places they can go with a simple design. Then iterate to make it all work well with the best compromises. I like your process, but don't get too caught up in camber curves. After all, most baja cars suffer most from broken components as opposed to bad camber curves. Consider looking at load paths to help define geometry and reduce component failure. We have now finished our vehicle design and have a fully modeled car including fasteners and everything. Our master assembly is so well CADed that we can even articulate our suspension and steering correctly. We did end up going with a huge focus on component design while we had a small dedicated focus going on vehicle analysis such as camber curves or vibration models (driver comfort/ergonomics stuffs). We really focused a lot of our component design on systems that would be very easy for us to machine in-house, reduced complexity, and would be easily replaceable even if it does break. We did of course keep an open mind to stress paths and creating parts that in theory follow good engineering principles and should reduce the risk of breaking, but I guess we will have to let the final vehicle decide at competition in Cookeville next April. Hopefully I can post some teaser photos for y'all of our mud dawgs car, but the suspension seems solid now. The rear end was a bit more of a beast to tackle with the trailing arm multi-link system that we chose having a lot going on. It was nice to separate the camber motions3 from the design of the rest of the trailing arm though. Here is a nice link to our youtube channel where you can see our suspension design in action as well as a few good short videos of our whole vehicle system. Hey appreciate the work you guys have put in your first design! I did notice quite a bit of bump steer at your rear suspension. If that was unintentional , you could probably still level it out by playing with the points in the multilink. 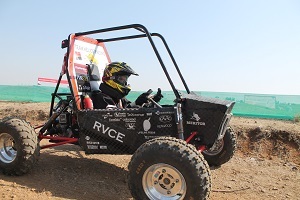 I'm a Korean college student participating in the Baja competition for the first time. Because we are participating for the first time, we lack a lot of basic information. We want to set the wheel base to 65 inches and the wheel track to 60 inches. Are there any criteria for determining the wheel base and wheel track? When the rear arm is trailing type, the change of the toe and camber in the bump situation is larger than that of the D / W type. How do you solve bump steer? Can you tell me the information?